My next project was a baby blanket for a neighbor whose second child was due in mid-January. I had some Bernat Cottontots yarn in a neutral color (light cream) and figured its machine-washability would make it a good candidate for baby gear. I’d always been sort of interested in the log cabin blankets in Mason-Dixon Knitting but really put off by the garish color combinations the book’s authors seem to favor. So I decided to give log cabining a try—in monochrome. I really, really like how this turned out, even with a few mistakes here and there (which weren’t discovered until well after I’d turned the next corner). The next time I do this, i think I’ll try a “smoother” yarn (the Cottontots has a twist to it that makes it appear a little textured), and I’ll be more careful when picking up stitches at the corners—something I didn’t figure out how to do properly until the blanket was halfway finished. 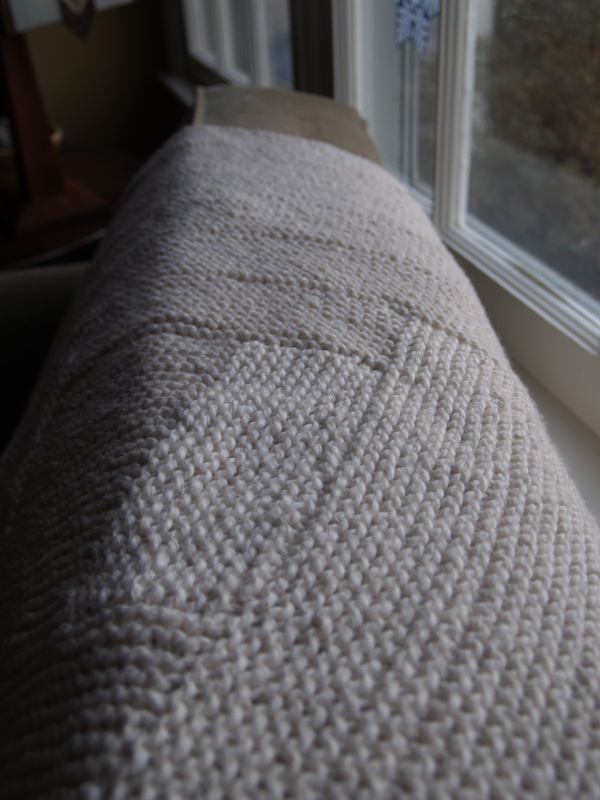 Even though this blanket consists of miles and miles of garter stitch, the fact that every eighteen rows I’d bind off a section and pick up stitches to start another kept the knitting interesting. I had five skeins of the Cottontots yarn when I started, and when I was near the end of the last one I called it quits on the blanket. It wasn’t quite 30″ on each side, but it did have symmetry (each side had six blocks), and it seemed a good size already. And I was ready to be finished with it. I used the rest of the Cottontots (plus a little bit of green dishcloth cotton when the Cottontots ran out) to whip up this little hat from Baby Knits for Beginners , by Debbie Bliss. I really love this pattern—it’s one I’ve knit many times before. It took some thinking, but I finally found a good project for one of the skeins of yarn Sylvia gave me for Christmas: I made a hat for her. It’s more like a bonnet, actually (and that’s what we’ve been calling it), and it’s similar to one wore by the character Lyra in the recent film The Golden Compass. Sylvia wore her new hat Friday morning to our weekly playgroup meeting, and when I was asked where I found the pattern, I honestly couldn’t remember anything beyond “online somewhere.” (Isn’t that where we find pretty much everything these days?) But I’ve now tracked it down. The pattern is available at Froggie Meanie, at Marmalade, and on the Lion Brand website. All of those patterns are free, and they include both child and adult sizing. I am thinking about making one for myself, too. After all, I’ve got another skein of thick yarn that Sylvia gave me…and what else am I going to do with size 19 needles, anyway? Shortly after I started knitting, I saw some knitted “fruit hats”–you know, the ones that make babies’ heads look like strawberries or blueberries or whatever. I bought the pattern and realized that I didn’t know any babies. 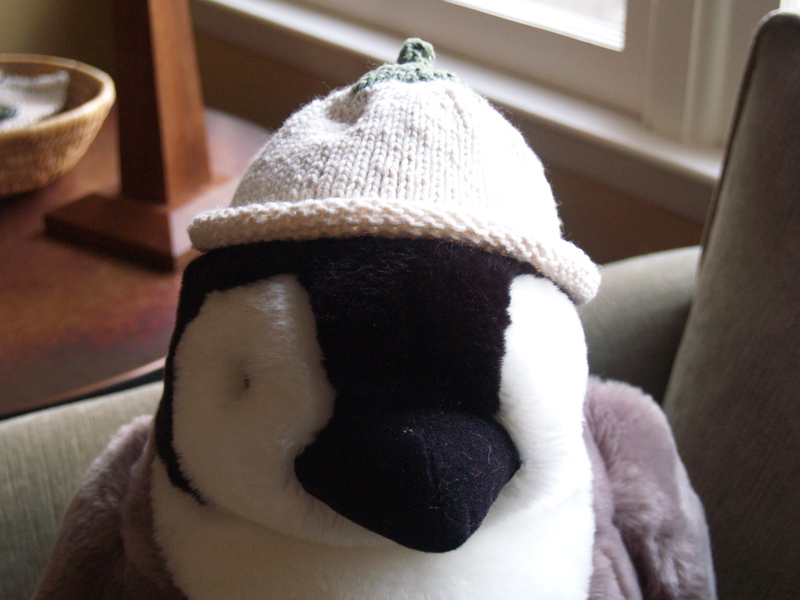 So I knit adult-sized hats as several gifts. (This was my first experiment with modifying patterns.) I knit one orange hat with green leaves and a green stem–I called it the Pumpkin Hat, and I wear it proudly every Halloween. Apparently, some other knitters out there agree with me that pumpkin hats aren’t just for kids. Crazy Aunt Purl just created her own pattern for a knitted pumpkin hat–and a reversible one, at that. There’s another knitted pumpkin hat pattern at Crafty Crafty. If you’re not keen on wearing pumpkins but still want them around, try knitting up some seasonal decor: felted pumpkins. The best part is that they’ll never rot. If pumpkins really aren’t your thing but you want to keep warm while trick-or-treating, a knitted skull illusion scarf may be more up your alley. Of course you need a bag to haul all that candy loot, right? This candy corn-shaped felted bag should do nicely! We went up to New York for the weekend–first to upstate New York (to visit my mother-in-law), then to Manhattan (to visit a friend who just had her first child last month). I usually get lots of knitting done on these sorts of trips, and this time was no exception. 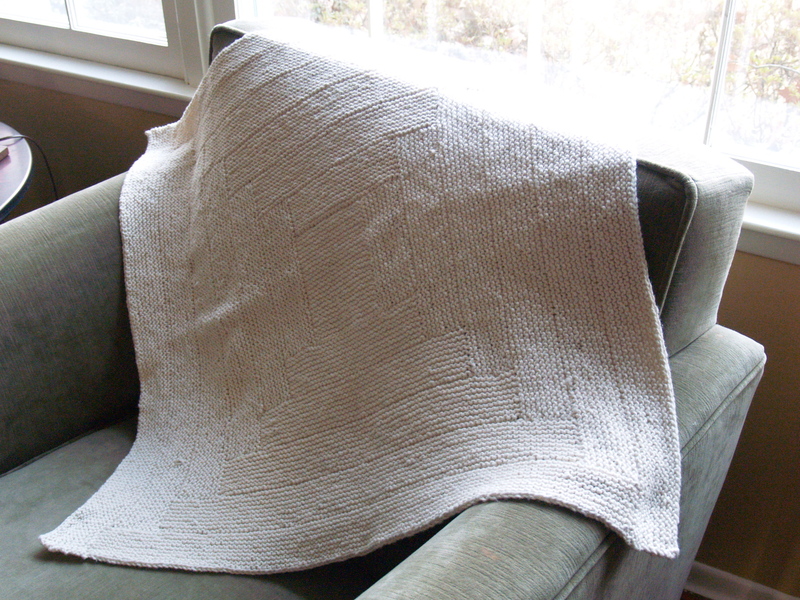 While at my mother-in-law’s house, I finished a recordbreaking three items–and knit a fourth from start to finish. Three of them are gifts, so I can’t discuss them yet. But I can show you the one I knit for myself. 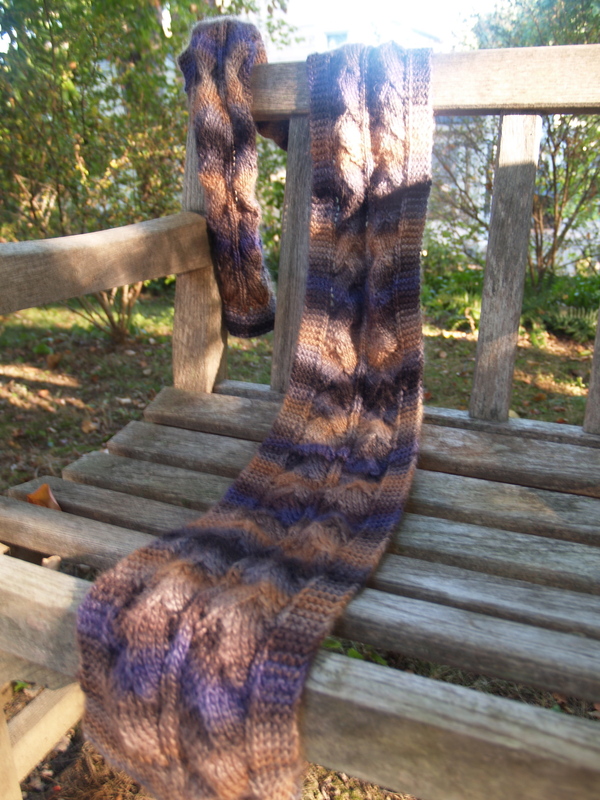 It’s the dragon-scale scarf I started back in April, with Patons SWS (wool-soy) that my SP9, Lynnette, gave me. I finished a third skein on Thursday evening while knitting with friends and was considering calling it quits there, but they unanimously urged me to use up the fourth skein, too. And I’m glad I did–the result is something that can wrap around my neck several times without coming undone! I love the colors in this scarf, too! It’s still unblocked (how do you block something this long, anyway? ), but I love how it looks and am really looking forward to wearing it this winter. Once upon a time, there was a knitter named Goldilocks (who really had brown hair, but hey, who says fairy tales have to make any sense?). She went to Vermont and while she was there purchased lots of handspun super-bulky yarn, some one hundred percent merino, and some mostly merino with a bit of tencel included. One day, she decided to knit a hat. She carefully wound the blue yarn in a ball, cast on 36 stitches, and started to knit it, with size 13 needles, in garter stitch. 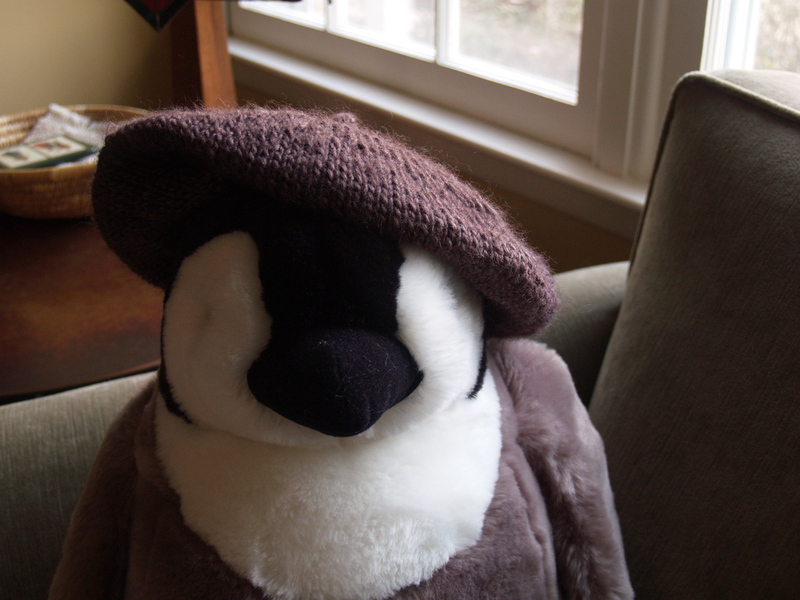 She opted to make a brimless hat, and when she neared the top she sighed, “Alas! Surely I am screwed because I lack double-pointed needles in this size.” Luckily, her good friend Pat heard her call for help (kind of hard not to, when she’s sitting right there at the same table in the coffee shop) and taught her how to use two circular needles to finish the hat. The finished hat was too big for the knitter but fit her husband (who likes blue and doesn’t like brimmed hats) just right. Two days later, armed with this new technique, she set out to make another hat. Using size 13 needles once again, she cast on 32 stitches with purple yarn. After a while, she switched to magenta yarn, then back to purple. The finished hat was too small for the knitter but fit her daughter (who is mad for purple and doesn’t care about brims one way or another) just right. The next day the knitter sat down with red yarn and size 13 needles and cast on 36 stitches for another hat. 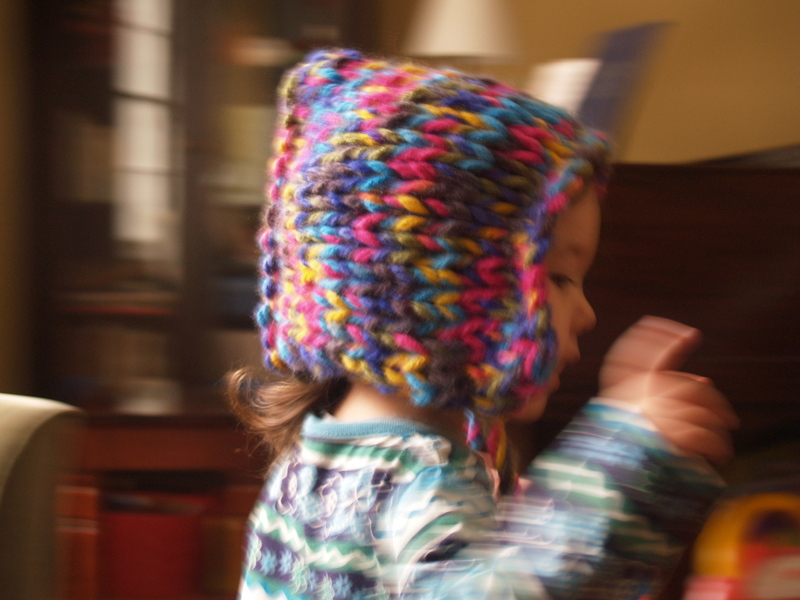 After knitting the fold-up brim she switched to a multicolored yarn with predominantly red tones and never looked back. And the finished hat fit her just right! Let me just say that when you’re jonesing for project-completion satisfaction, few things can take the place of knitting hats with big yarn on big needles. Each of these took less than two hours to complete. It doesn’t hurt, either, than the yarn was a real pleasure to work with. So now Sylvia, Jan, and I all have hats that sort-of match each other but are unique. Sylvia loves hers but gets annoyed when Jan or I try ours on. “Those are for winter!” she scolds. While waiting for winter to get here, she’s using the hats as hiding places for her Schleich toy animals. Go figure. Winter has finally arrived, after battling its way through the unseasonable crazy-warm temperatures we’ve been having for the last couple of months. If you want to do some cold-weather knitting, but are tired of simple hats and scarves, nervous about thumbs for mittens and gloves, and reluctant to commit to a big sweater, then wrist warmers (a.k.a. fingerless gloves with holes for your thumbs to stick out) might be just the ticket. Here’s a handy-dandy page that generates a pattern for you when you type in your wrist circumference, gauge, and needle size. This could be a great way to use up some stash yarn! And if you’re saying to yourself, “Hey! 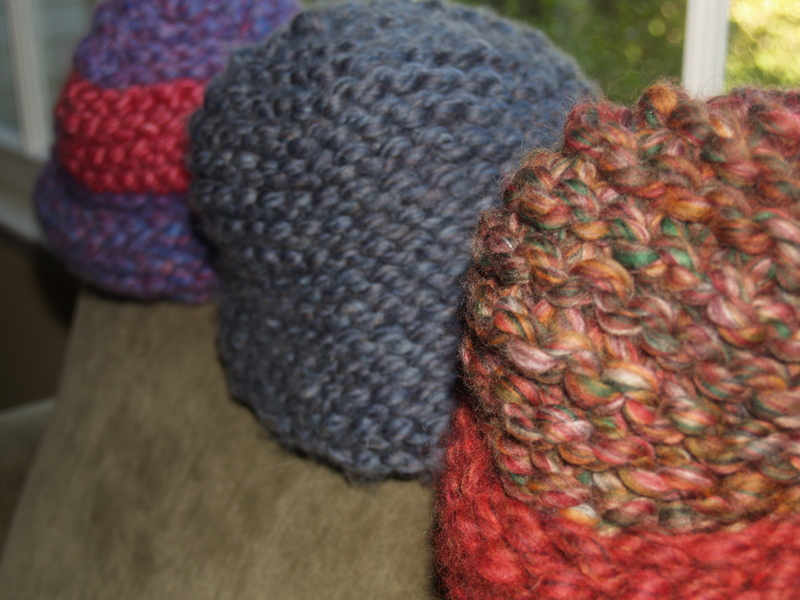 I want to knit more hats! And I have no fear of thumbs!” then this may be the pattern for you.